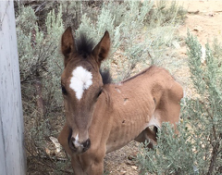 Our wild horses, native wildlife, rangeland ecosystem, taxpayer dollars, and western way of life are threatened by a growing overpopulation of horses and burros throughout 10 western states. The National Wild Horse and Burro Summit was held in Salt Lake City, Utah on August 22 - 24, 2017, to consider the current situation and science regarding the management of free-roaming horses and burros. ​Coalition members attended and participated in the Summit to help raise awareness of the issue and advance policy changes that will improve the sustainability of our rangeland ecosystems. ﻿​Wild horses and burros are to be managed according to the Wild and Free-Roaming Horse & Burro Act of 1971, which specifies where wild horses and burros can occupy public lands, and that they shall be managed in a manner that produces a thriving natural ecological balance. In addition, the Bureau of Land Management (BLM) and U.S. Forest Service (USFS) are required by law to manage and balance multiple uses of public lands, including wildlife, horses, and cattle grazing. Horses and burros currently roaming the Western landscape are not native to North America. These animals are descended from domesticated breeds brought to North America from Europe. Learn more. Wild horses and burros are managed by federal law, and are only authorized to be on BLM and USFS lands. 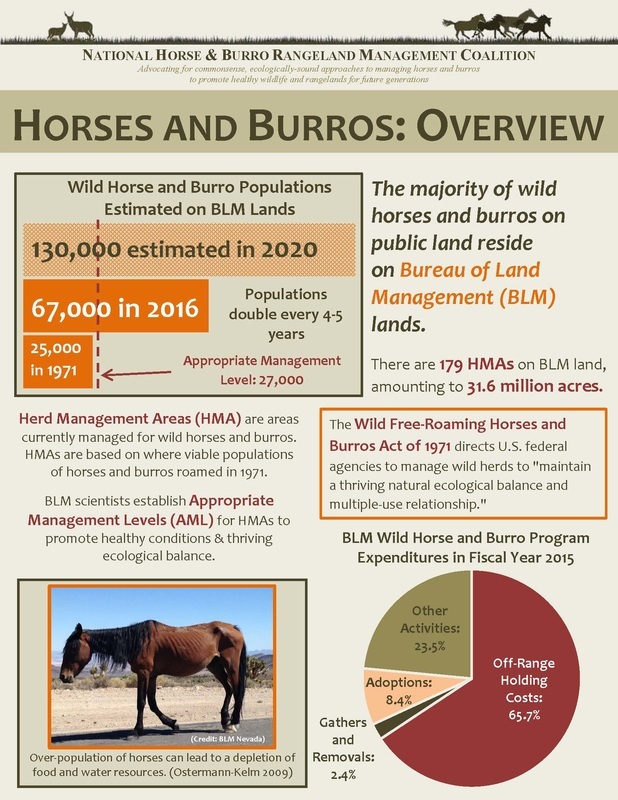 BLM estimates their lands contain over 82,000 horses and burros as of March 1, 2018. USFS provides a rough estimate of approximately 10,000 horses and burros on their lands. Free-roaming horses and burros are also present on other federal, state, and tribal lands - however, these animals are not "wild and free-roaming" as defined in the federal law, and therefore are managed differently. The total number of free-roaming horses in the United States is likely in the hundreds of thousands. 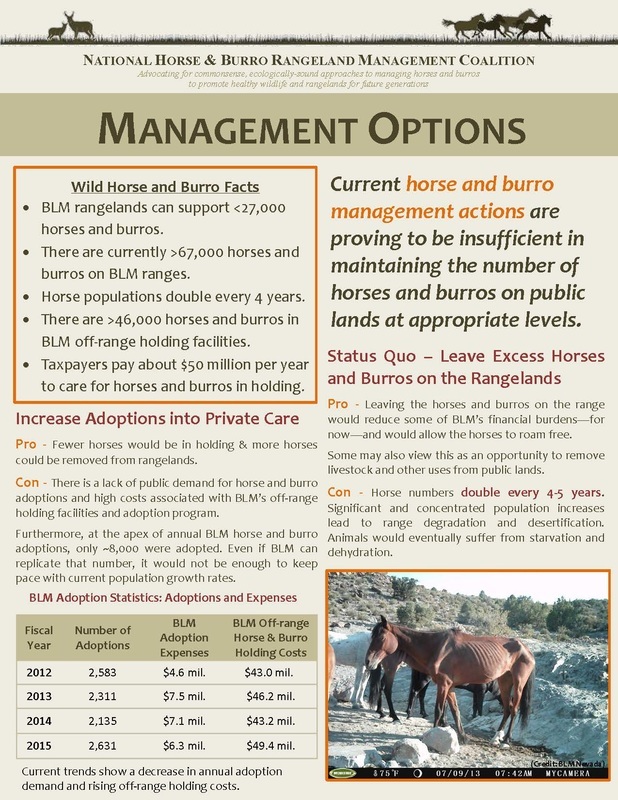 BLM lands where horses and burros should be managed can only support 27,000 individuals in balance with the ecosystem and other uses of the range. This means there are over 55,000 excess horses and burros, degrading our rangelands. 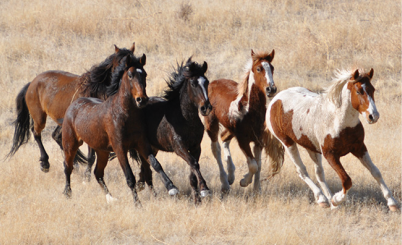 Wild horse and burro populations have a demonstrated ability to grow at 18-20% per year. This means their populations double every 4-5 years without proper management actions. BLM currently uses a mixture of gathers and fertility control options to manage populations. However, these actions an not currently being used to the extent necessary to stop the growth of the horse and burro population, and our rangelands continue to be deteriorated. 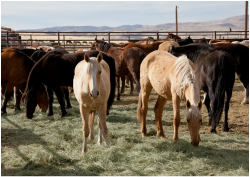 Horses and burros gathered by the BLM are held in holding facilities. A small number of them are adopted to private caretakers. The vast majority remain in these facilities, cared for by the BLM. These facilities currently house over 48,000 horses and burros, costing the American taxpayer nearly $50 million per year. impact on our public rangelands in the pages below. Wild horses and burros are at risk of starvation and dehydration. There are not enough resources on the range to sustain their overpopulation. The Western way of life is based on healthy rangelands. Hunters, ranchers, and outdoor enthusiasts all rely on healthy rangelands that are being compromised as a result of inadequate federal management. 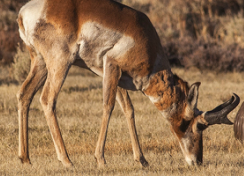 Many of our nation's wildlife species rely on healthy rangelands. 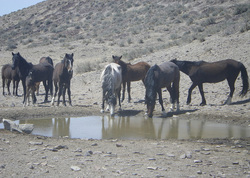 Non-native horses and burros compete with native wildlife for scarce food and water resources. Taxpayers contribute millions of dollars each year to wild horse and burro management. Unless changes are made, expenses will continue to rise. Overpopulated horse and burro herds are threatening the health of our rangelands by compacting soils and removing vegetation, eventually causing desertification. You can encourage changes to our nation's wild horse and burro management, and help achieve healthy herds on healthy rangelands.